Protection of every PLC program is important to save your PLC program and its setting, so that it is not duplicated or stolen. In this tutorial we will tell you how to Set/Enable password in Delta PLC using WPLSoft programming software. WPLsoft does not have a simulator within so you cannot verify this. 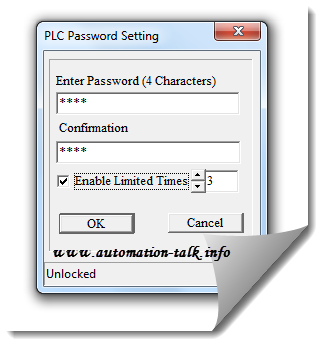 Setting and releasing password in Delta PLC is a simple process and you just have to go to Communication tab for it, as explained and shown below. Subscribe to Automation-Talk by Email. 1. Go to Communication tab as shown, and click on System Security. 2. Now click on Broadcast Communication setting. 3. Click on Enable Password. 4. After clicking on Enable Password, you will see below screen. Now just enter your desired password and confirm it. Which is then written to PLC. If you tried setting it offline, it may give you error. Note: You can also limit number of retires for password by just checking the box which says Enable Limited Times. See above image for reference.